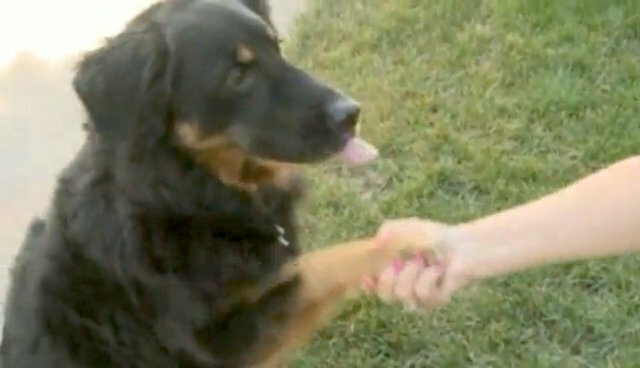 The mystery surrounding a woman's missing wedding ring has finally been solved five years after it vanished -- thanks to a purloined popsicle and the thieving dog's upset stomach. Lois Matykowski says she and her granddaughter were outside enjoying the icy treats on a hot day in Stevens Point, Wisconsin two weeks ago when her dog, Tucker, snatched away the girl's popsicle and wolfed it down, stick and all. It wasn't such a unusual offense, Lois told news station WTVR. Apparently, he does that all the time. "He's known in the family to be the food burglar," she says. "I look in the paper towel and here is my wedding ring. I kid you not. My wedding ring was in Tucker's puke!" Lois says that she was devastated when her ring had gone missing without a trace from her home five years earlier. But as it just so happens, the jewelry was never far away. Tucker's vet says that the ring had likely been stuck in the dog's stomach all that time, becoming dislodged when he swallowed the popsicle stick. Just to be safe, Tucker got an X-ray, but there were no other treasures inside him. Lois doesn't seem to upset that her dog had been keeping her ring hidden all this time. "I have my wedding ring back and Tucker is big dog on campus right now. He's my hero," she say.